This has turned into a two day work week. We had two days off at the beginning of the week and then today the PSAT dominated the school day. I am a huge planner. I am not a huge pacer. I like to have structure, but then I like to see where the kids take us each week. I am not a big fan of phrases like “covering the material” and getting through the content”. I hate wasted time. I love having more time than I thought. 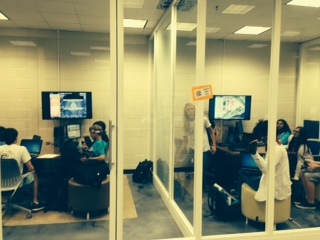 Today in AP biology we visited our school’s new “learning commons”. 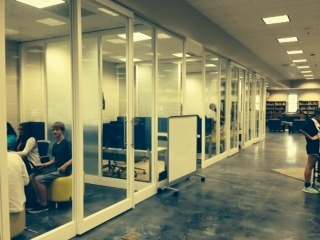 The learning commons (LC) is the new “media center”. It was transformed last year with a $250,000 grant from our county into a state of the art, digital learning area. One of the big features I like are the “meeting rooms”. Each room is almost soundproof and has a flat screen TV with hook ups for any sort of computer. Kids can meet there and work on projects. The walls are all writeable glass. So, today we went there to work on the history of the earth assignment using the HHMI History of Oxygen on Earth and the Earth Viewer app. The app is installed on Ipads and kids projected an Earthviewer onto the flat screen and individually had computers or Ipads to answer the Google for questions. We also re-planted the Fast Plants today for the artificial selection lab. 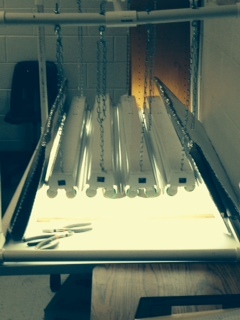 I made a brand new light bank and Heidi at Wisc Fast Plants was nice enough to counsel me through some of the mistakes i was making. I really hope we have better luck. This entry was posted in Uncategorized on October 9, 2014 by Bob Kuhn. Today the honors kids finished up their biome exercise and white boarded the results. 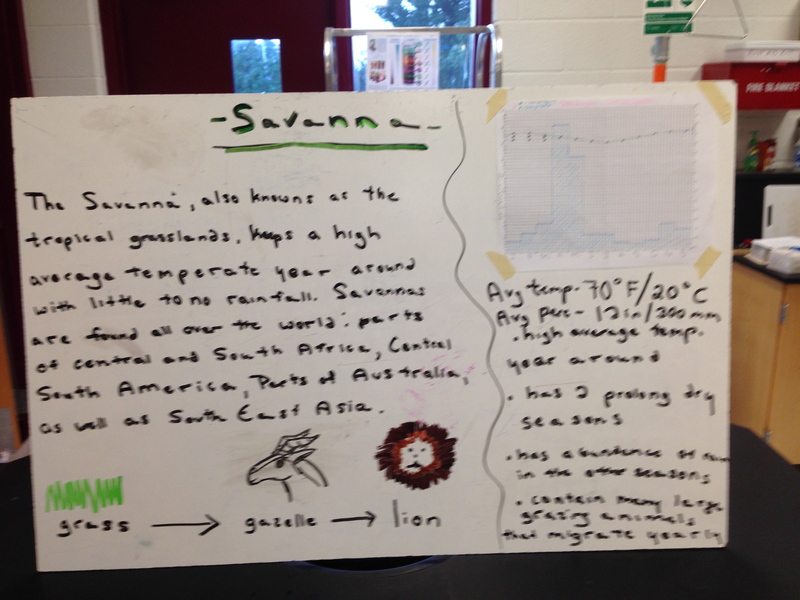 The white board had a title, general information, a climatograph and a summery of the ecological impact to the biome. 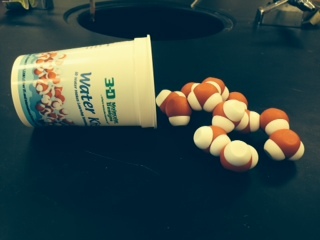 In AP biology the students received contrary information to the life’s origin point of view from yesterday. They did a great job learning from each other and I felt that this was a whole lot better than lecturing about it. This entry was posted in Uncategorized on October 8, 2014 by Bob Kuhn. 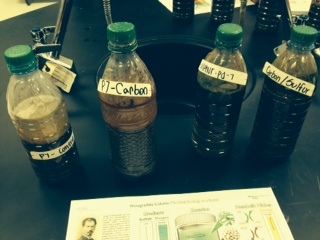 Today in honors biology we took about 15 minutes and looked at the Winogradsky columns. It has been 4 weeks and the layering of the bacteria is awesome. We definitely have cyanobacteria, iron reducing and sulfur reducing bacteria and hopefully the stratification will get even better in the next 4 weeks. We also began a biome activity where the learning groups pick a biome, research the basics, create a climatograph, and read a case study on an environmental impact in that biome. They then will whiteboard and explain the biome to their peers. Totally formative, assessing two learning objectives. In AP biology we started a slick case study debate from the National Center for Case Studies (University of Buffalo) on the origins of life. In day one, kids are broken into two groups and learned about either the metabolism first origin or the replication first origin. Then they went back to their quad groups and taught each other. Tomorrow they will divide again and get conflicting information and consider how their new refutation information fits into their original idea. This entry was posted in Uncategorized on October 7, 2014 by Bob Kuhn. My daughter struggles with math the same way I did in school. She gets tired and loses patience and makes easy mistakes. Sometimes our weekly Sunday math sessions can become very contentious. I wanted to go over the commutative, associative and distributive properties with her and was trying to avoid a worksheet straight away and maybe use it later for verification. I decided to use a jar of paperclips to use to model from now on with math. They are small, colorful, not candy and easy to manipulate. I was really surprised and encouraged when she placed the paperclips into two groups of 3 instead of arranging them in a 2×3 pattern as you’d see on a worksheet. We then moved through equations modeling things like 3x(2+3) and distributing them (3×2)+(3×3); modeling 2+3 = 3+2 and 1x(2×4) = 4x(1×2). The paperclips really helped. When we used the worksheet for verification, she made a couple of mistakes but it was a lot less aggravating. I feel that she understood the properties better than she would have a trick. It took longer to teach and learn, but I’ll see if this technique helps pay dividends in the long run. This entry was posted in Uncategorized on October 5, 2014 by Bob Kuhn. In the ongoing saga of our plants… I contacted Heidi at Fast Plants and she was awesome in her analysis and recommendation. So, I am going to replant next Wednesday and use a new light bank with 8 lights and hopefully I will get better results. In AP biology today we watched the HHMI short film on the speciation of anole lizards in the Caribbean. We then proceeded into the virtual lab. 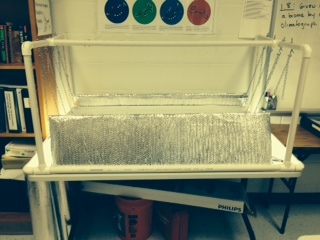 The lab is great but there is no way for kids to save work if a module is incomplete. That was their beef. Tomorrow we will complete it and wrap up speciation. In honors biology we used a spreadsheet to calculate the total energy consumption of the owls in the model ecosystem. This data came straight from the owl pellet prey and it was cool to see how so little owls can be supported in the ecosystem, based on the trophic structure. The kids can then go backwards, calculating the energy needed at each level. This entry was posted in Uncategorized on October 1, 2014 by Bob Kuhn.